It’s not a sandwich—it’s a panwich! This lovely butterfly is a peanut butter pancake with fresh fruit, cereal and licorice antennae. CAPSULE REPORT: This is the third of six award-winning, delicious and nutritious recipes developed by children in Jif’s annual “Most Creative Peanut Butter Sandwich” college scholarship contest. Click on the black links below to see the other recipes. For more peanut butter recipes and product reviews, visit our Gourmet Peanut Butter Section. 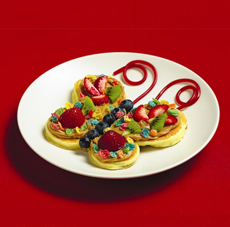 From Mountainville, New York, 11-year-old runner-up Kelsey Fosstveit presented this fruity, peanut-buttery pancake treat. Though kids may love the fruit cereal and cherry licorice extras, grown-ups (or parents seeking less sugary options) can substitute less colorful Cheerios, corn flakes or other crunch cereal. This recipe requires some practice to create the butterfly wings from batter, but an 11-year-old child did it, so you can, too. In large bowl, combine pancake mix, eggs and milk. Whisk all the ingredients together. To form each wing, pour 2 tablespoons of batter onto lightly greased pan. Pour 1 tablespoon of batter below and touching the larger one. Cook the butterfly pancakes. To put together, place 2 wings on your plate to form a butterfly. Top with 2 tablespoons of creamy peanut butter, fruit, cereal and cherry licorice.